Predictions for week 22 in the Premier League follow another weekend that saw a shakeup in the table at both the top and bottom. I’m sure another weekend of matches will bring us more excitement. Week 22 begins with six matches being played at the 10:00/15:00 time. Having moved out of the bottom three Burnley play at home again and hope to create some distance with their match against Crystal Palace. Likewise, Aston Villa hope to move further away from a relegation battle, but have a difficult home game against Liverpool. Queens Park Rangers will be happy to return to the comforts of Loftus Road, but will be facing a dangerous Manchester United who will be looking to rebound from their disappointing home loss to Southampton. Chelsea should be able to maintain their lead at the top, however Swansea will not make it easy on them. Sunday’s late match is another exciting one with Manchester City hosting Arsenal in hopes of keeping pace with Chelsea. Arsenal looked good at home against Stoke and will be looking to keep that form going in week 22. Everton’s match against Manchester City was a much deserved and hard fought draw and gives them some impetus going forward. Facing West Brom will be a good test for them to see if they can keep pushing, however, they will also be going into Monday’s game after playing a midweek FA Cup replay. 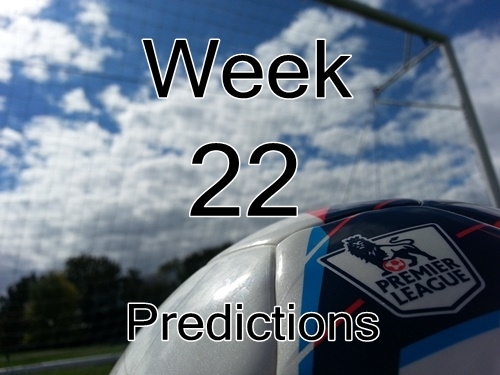 That is the roundup for week 22 predictions in the Premier League. It is shaping up to be yet another great weekend of games and will bring with it yet more implications for placing in the table.